Every event tends to generate trash and garbage management can get difficult. Unmanaged garbage cans can be an eye sore, spoiling the entire presentation. Smart event management is also about garbage organization and pail covers are the most recommended way to conceal unsightly garbage cans. Premium Spandex Garbage Pail Covers are the preferred choice of event planners who want to ensure that every bit of their event is beautifully coordinated, including the garbage pails. 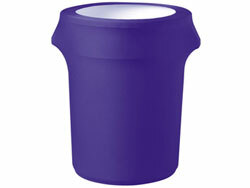 Now available in various colors, these garbage can covers also help banquet hall managers reuse worn-down waste disposal cans, layering the pail in a colorful material. These elegantly designed garbage can covers can be chosen in a shade that complements the décor of the event. Spandex garbage can covers present a smarter way to ensure that no part of your event venue looks untidy. Stretchable covers can fit a wide array of cans and are quite durable. While pail covers in demure shades like black tend to blend into the event colors, those in slightly brighter shades add a bit to the overall décor theme. Easy to store and use, the premium pail covers are perfect for weddings, corporate events, grand openings, and places with high footfalls like market pavilions and hotel lobbies too. They are widely purchased by hotel owners, restaurant managers and event organizers. Designed while keeping both style and convenience in mind, the premium Garbage Pail Covers simply slide over, instantly turning an unsightly garbage bin into a decent-looking unit. Stretchable spandex blend fabric dries quickly, does not allow dust to accumulate easily, and it has a long shelf life. Why buy Premium Spandex Garbage Pail Covers from RazaTrade?